Left to right: Reza Moreno (editor), Denisse Jimenez (content producer), and Stephanie Aliaga (founder) at Zonamaco, Mexico City in February 2019. Mujeristas Collective is a collective and platform for the voices of Latinas and women of color based in Queens, NY. We produce zines to showcase contemporary art and writings that construct our own experiences and identities within the framework of mujerismo, Latin American feminism inspired by womanism. Drawing on one of its core tenets of solidarity, we cater to all women of color as well as Latinas. Using zines and community events as our medium, our goal is to document, educate, and present a diverse collection of work by women of color from a global perspective. Our zines have been featured in People Español Chica, NYLON, and i-D magazine. Ada Maria Isasi-Díaz (b.1943-2012) was from La Habana, Cuba and in 1960, she went to the United States as a political refugee. Seven years later, she joined the Ursuline sisters in Lima Peru as a missionary, serving in the María Madre de Dios Parish as a Junior High School teacher. Isasi-Díaz was an activist-theologian involved in the feminist theological movement. She worked on developing and elaborating a Mujerista theology, a theology from a U.S. Latina perspective and wrote publications: Mujerista Theology: A Theology for the 21st Century (1996), En la Lucha/In the Struggle: Elaborating a Mujerista Theology (2003), La Lucha Continues: Mujerista Theology (2004). 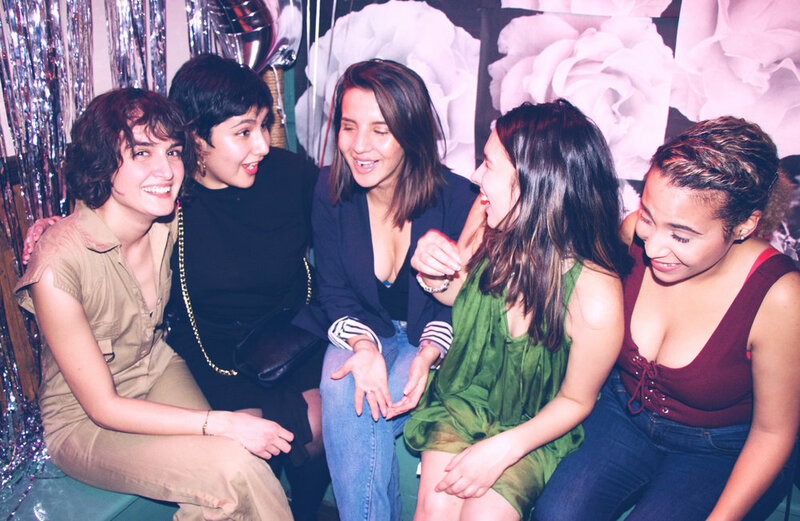 Mujeristas Collective was founded by Stephanie P. Aliaga in January 2017, due to a lack of spaces for Latinas to meet and create art that centers on our identities and cultures. Mujeristas Collective is inspired by Cuban activist-theologian, Ada Maria Isasi-Díaz's Mujerista Theology. The term Mujerista was introduced by Ada Maria Isasi-Díaz. Womanism inspired Isasi-Díaz to construct her own experiences where grassroot Latinas can relate by creating the very first Mujerista theology. Díaz emphasized that Mujeristas and Euro-American feminist must share the power and “be considered to be just as important as the priorities of the Euro-American feminists." This invites all women of color to the global movement for women’s liberation. It provides a platform for the voices of Latinas in America that are often overlooked in their homes, work place and church. Díaz’s Mujerista theology encourages everyone to participate in the struggle for the liberation of Latinas and our communities. Mujeristas Collective is run by five Latinas who are artists, journalists, and educators. They are recent graduates from St. John’s University in Queens, NY, where the collective was formed. Stephanie is a journalist, artist, and community organizer based in Queens, NY. As an artist, photography and zine-making are her tools to creatively document local grassroots stories. She received her Bachelor of Science in Journalism and a minor in Photojournalism from St. John's University in May, 2018. During her time there, she founded the first feminist organization on campus, Feminists Unite, that continues to hold meetings today. Ariana is a writer, journalist, and aspiring law student from the border city of El Paso, Texas. She writes with a focus on local politics, community issues, and social justice. She is the founder and editor-in-chief of Ojo Magazine (formerly Trascender), a publication by and platform for people of marginalized identities. She was an editorial intern with the Queens Chronicle and is the former co-news and features editor of the Torch, the independent student newspaper of St. John's University in Queens, New York. She holds a Bachelor of Science in Journalism from St. John's University. Denisse graduated from St. John’s University earning a Bachelor of Science in Television & Film Production with a minor in Dramatic Arts and International Studies. She was born and raised in Colombia, and moved to the U.S. seven years ago. As an actor and filmmaker, she aspires to tell stories that often go unheard, but are so crucial to the creation of a new narrative in today’s entertainment industry. She recently wrote, directed, and co-produced her thesis film, Incubus, and is currently submitting her film to festivals. Reza is a journalist and editor-in-chief of SUSTAIN, an online media platform normalizing a planet-friendly lifestyle. Originally from Southern California, Reza came to study journalism in Queens and earned a Bachelor of Science in Journalism and a minor in Business from St. John's University. She was an editorial intern at the NY Daily News and is the former features editor of The Torch, St. John’s University’s independent school newspaper. Yovanna received a Bachelor in Elementary Education with a concentration in Spanish and is now working on her Master’s in Literacy in Education. Her desire to become a teacher came from her passion for equal education after noticing the educational disparity from her younger cousin who emigrated from Dominican Republic. After graduation, she plans on studying the education system in Europe and teaching abroad.